S1gnsOfL1fe started a topic What are you working on? I thought since all of us have different projects going on AND now that we have a developer in the mix, we should create a "What are you working on?" thread!!! Right now I'm 2/3 the way done with a brand new untitled ambient album. Got a brand new track to put up in the next couple days and looking forward, I'm really excited about this new album release!!! Any links for the Drone Metal stuff? Or is it still in the oven? Still in the oven! I have a cover of Wandering Flame from the Final Fantasy X video game soundtrack that I just did a quick polish of and put back online - the version I posted is from about eight years ago. My version is here: https://www.jasonvincion.com/ffx/Jas...ntasy%20X).mp3 - I guess maybe heavy ambient would be a little more accurate, since it doesn't drone that much. The new version I'm working on will try to bring all my influences together, but I have a feeling it'll probably sound pretty similar to this. Oh well! I LOVE it; it finds its way in almost every patch I've made so far (subtle or not so subtle) and the easter egg modes are awesome. I really wanted a clouds and was bummed to hear it was discontinued, but when I found a quality build by a reputable builder in less hp I was all over it. I've watched a couple of YouTube videos on Clouds and it sounds great but I was worried that, for the price at the time, it would become a one trick pony in my hands. But, as you say, the up-side is that there are now smaller versions of the module out there. Trouble is, there have been rumours for some time now regarding a new and better Clouds-like module. I have given up watching out for that now but I am sure that I'll hear about it on the grapevine (YouTube) as soon as it is released. My jaw hit the floor when I saw the list of all of the disting's capabilities. Yes. And more can be added, apparently. I'll be sharing some of my modular tunes in the upcoming months. How are you finding the micro burst (Clouds)? If I was to get any more modules then that would be on my shortlist for sure. Thanks for the insight synkrotron! I'll be sharing some of my modular tunes in the upcoming months. It's been a really fun journey so far and definitely one I plan on continue going down. synkrotron Quite the set up! I guess that as you already have Rings that Elements wouldn't be on your shortlist. Rings certainly has advantages but I would miss the external audio inputs. And of course with Maths you have the ultimate function generator. I never bothered with it because I found it difficult to grasp, compared to a standard ADSR module and I would rather have a number of different envelope gens and LFO's in order to modulate all my filters and Elements. In fact my Ornament and Crime module has only been used as an LFO since installing it. I also use my Pam's for LFO duties as well. Instruo stuff is quallity, although as yet I only have the Harmonaig. I would love to add more of their modules to my system. I met Jason last year at a modular meet and he's a real nice chap . I like my Wasp. Not a lot of modulation inputs but it does have a lot of character. I use it a lot that one. I've taken a deep dive down the rabbit hole, using Every Noise at Once to go through my entire Spotify artist collection, collating the data and scanning through the 427 genres that came up, trimming those down to 174 genres and doing a more involved sampling of those genres, then trimming those down to 69 genres and finding out how those all intertwine. The results came out that my main interests are in the ambient, electronic, jazz, and metal genres, with secondary interests in the classical, pop, rock, and world music genres. I'm not quite sure how I'm going to fit those all together in one project, but I think I can get most of them by expanding upon the ideas I worked with on Icebound Desolation and going more drone metal with it. I'm reminded of an album I heard ages ago that stuck with me from the band Krakatau called Volition which had the mood and abstract nature I'm looking to bring forward as well. Along with the drone metal pieces, I'm working on getting a downtempo-type project going, along the lines of a set of old video game covers I did or my Mindtrap album. Both the drone metal and downtempo projects are built off of guitar arpeggios, but in completely different ways. I might be going mad, but I think the madness is leading somewhere interesting. Here's hoping! Trying to keep my system small(er) since I'm just starting out. Looking at the instruo ts-l for my analog oscillator, the Jove as another filter (though I am considering a Doepfer 103 and Wasp instead), the XOAC Devices Zadar for evelope gen, the intellijel Quad VCA, and at least one Disting as a back pocket utility. Going for two voice drone with subtle leads on top, or counterpoint leads with a drone. Looking for another smaller in rack sequencer and probably a keystep and/or sq-1. I've really debated doing eurorack for a couple years, and I have to say I'm VERY happy I finally did it. Coupled with the synths I have and guitar/bass I just feel the creativity flowing much easier. Any go to modules you can suggest? Ooohh... Where to start LOL! I guess I should ask, what do you have so far? It is working out great for making up to four, perhaps five independent drones. At the moment I am sticking with four. So, enough oscillators and filters. But I suppose that, with any system, the "go to" at any time would depend largely what you are doing. For instance, if I am doing sequencer stuff then the Metropolis is great for that, although I do have a Beatstep Pro too. And I also like to utilise a couple of the Distings for quantizing arpegs. Can't wait to hear your drones! synkrotron I too have been recording modular jams and turning them into tracks for an album I hope to put out sometime in July through Arachnidiscs Records. Been getting really into modular, just sold off a lot of my retro game collection to fund building my eurorack further.  Any go to modules you can suggest?